The Beijing Public Security Bureau asked Yao Chen to help them fight internet and instant messaging fraud which is especially prevalent during the holiday period. A top cop from the Haidian district looked very pleased with himself when he gave Yao Chan an official proclamation and a pointy piece of Lucite. She unveiled the posters for the campaign. 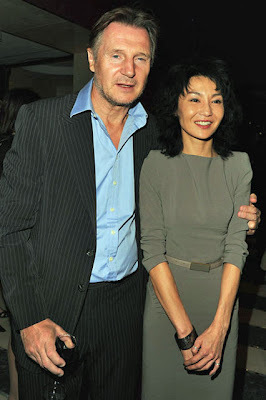 They showed Yao Chen smashing telecom fraud monsters with a baseball bat, hitting them with her elbow, catching them in a net and slicing them with a light saber, all while wearing platform heels, satin boxing trunks and a no nonsense look. Karen Mok sends pictures from Italy; Maggie Q beats the publicity drums for "Nikita"
Not sure if the photographer was trying for a romantic, sepia-toned look with Karen and Johannes and messed it up or if these are just poorly done pictures. Here they are overlooking Florence. "I would have been GREAT in "Titanic"
Maggie Q was looking quite stern and cleavagey in these pictures to remind us to tune in to "Nikita" sometime. Zhang Ziyi won the award for best actress given by the 2011 First Youth Film Festival held at Qinghai University in Xining. Or perhaps they convinced her to show up by announcing she was being honored. She wore a leather jacket with lots of zippers--plenty of pockets to stow her new slab of Lucite. This is lovely--you do know my name isn't "Cecilia" don't you? The Chinese edition of the iconic French fashion magazine ran an editorial with Gong Li. Black and white images, her hair slicked back, looking at some distant point away from the camera and shot on an anonymous waterfront it was almost abstract, a celebration of her Gong Li-ness--as well as the clothing and jewelry the magazine is hyping here, of course. Cecilia Cheung and Zhang Ziyi meet the press for "Dangerous Liaisons"
It's all laughs and smiles and Christian Louboutin spectator pumps now but it may be a different story later when the casting is announced. If director Hur Jin-Ho sticks close to the 18th century original there are two roles that, one imagines, would fall to either Cheung or Zhang: Madame de Tourvel, a married woman known for her piety and fidelity whose husband is out of the country and Cécile de Volanges, a virginal convent girl. With co-star Jang Dong Gun--the Valmont who seduces one of them and falls in love with the other. It's Fashion Week in Milan so Karen Mok to a break from wedding preparations to see what Ferragamo will be offering next Spring. Last spring a Ferragamo craftsman recorded her foot measurements. According to Xinhua she will be getting "classic heavy-bottomed Karen heels, and in particular match the mosaic crystal satin bow". No matter what style the shoes will be sure to fit. Yang Mi was in and in front of Moschino--she is certainly quite chic but never cheap. “Dream Home” is a terrific slasher flick. It is full of inventive and horrible ways to kill people and allows us to (or insists that we) watch them suffer as they die. It showcases Josie Ho Chiu-Yee a terrific actress; she creates an over the top but still credible character in Sheung whose taste for slaughter is undiminished by the pile of corpses at the end of the movie. On one level it works well as a commentary on how the Hong Kong property market turns people into monsters as more buyers compete for fewer prime flats and the competition strips away their already thin veneer of civilized behavior. Edmond Pang Ho-Cheung undermines any more profound message by showing us just how ordinary Sheung’s experiences have been. As a child she was one of many thousand uprooted from their homes by rapacious developers and the triad thugs they employed. While this was the beginning of her obsession with finding the perfect apartment and responding to that obsession by becoming a remorseless killing machine, most of those who went through the same situations continued to live lives of quiet desperation—or at least, if we are to accept the movies as a reflection of reality, they didn’t become crazed killers. We meet Sheung for the first time at work. She is one of hundreds in cubicles pitching loans from the Jet Bank to people who either don't need them or can't afford them. She has to keep smiling and calling, dialing for dollars to finance her dream. 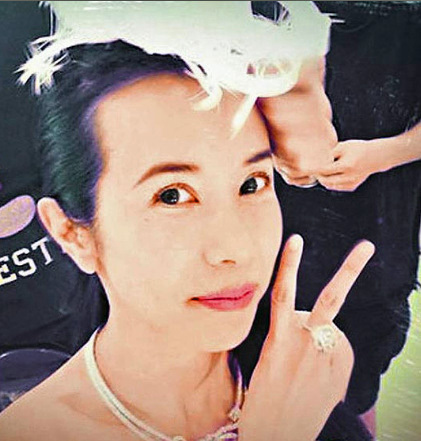 Her co-workers are presented as typical Hong Kong office drones. Their idea of a fun weekend is cheap hotel rooms with cheaper liquor and staying hammered for the entire time. They are amoral, coming up with a plan to sell the names of those who want loans but can’t pass the credit check to a mob-connected loan shark. Sheung spends time with them at work and on breaks but with two part-time jobs in addition to her work for the bank and a dying father at home she never is part of their social circle. She has a married lover, played to loutish perfection by Eason Chan Yik-Shun, who arrives late at the love hotel room she booked and paid for and leaves to go home to his wife and child while she is still asleep. Most of “Dream Home” takes place late in the evening of October 30, 2007—digital time and date stamps keep us informed as the slaughter progresses—with flashbacks to Sheung’s childhood, her adolescence, her mother’s death and most recently, the soon to be fatal illness of her father. While the murders are justified or necessary only in the depths of Sheung’s derangement the first is particularly gratuitous: she kills a security guard who is fast asleep in front of the closed circuit monitors he should be monitoring. A quick glance after opening the door to the security office would have been enough to get her past him and into the elevator to the eighth floor where her “real” victims await. A Filipino maid, hard at work at 11:00 PM while her employer lounges in bed complaining on a phone call to a friend about her husband, is the next victim, another case of incidental murder. The action gets absurd as Sheung heads for the door of the bedroom to kill the owner of the flat. Just as she reaches for the doorknob her phone buzzes and since the call is from her lover she answers it, pacing outside the door while he tells her to get a room, sneak in some bottles to avoid the corkage charge, bring a cake and get there by midnight. And it seems as if she plans to do all of that after up the errand she is on. Pang Ho-Cheung may be using this to heighten our realization of just how crazy Sheung is—as well as making a comment on wireless phone etiquette: let your calls go to voice mail when stalking someone you wish to kill. This victim is played by Michelle Ye Xuan and we see her horrifying death in exquisite detail—she is heavily pregnant and fights for her life and the life of her unborn child—in real movie time and then again in a detailed flashback. Pang lingers over it in a shot from directly above that reveals the fear and pain of the victim. The rest of the killings are done in the approved Grand Guignol fashion with mortally wounded people coming back to life, some severed limbs and an unmistakable reference to “The Story of Ricky”. Old Hollywood moguls Jack Warner and Samuel Goldwyn are both credited with originating “If you want to send a message call Western Union’, which means that it wasn’t original with either of them. But it is still good advice to filmmakers “Dream Home” doesn’t work as an indictment of the insane property market in Hong Kong and the gangster capitalists who control and profit from it (assuming that was at least part of Pang’s intention) because only one person in the movie turned into a cold-eyed killer because of it. More universally applicable would be an army of Romero type zombies made of those who committed suicide due to their losses in the housing market, a vengeful undead seeking the blood of those ultimately responsible for what happened to them. But that would be a different movie. 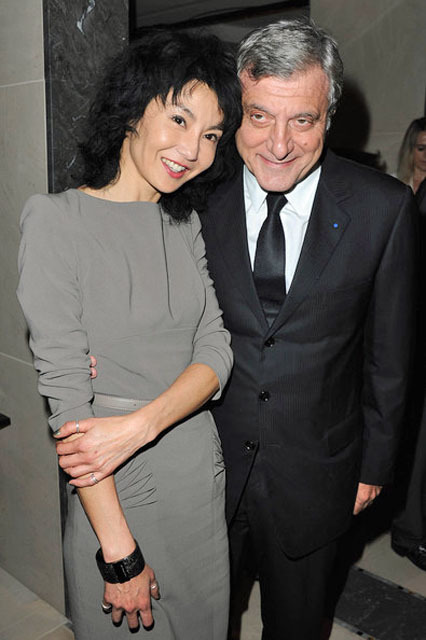 Ifeng had some pictures from Paris in addition to those from Zimbio in the post below including a few of Michelle Reis. but then got into the spirit of the event keeping a firm grasp on Maggie's waist. Brigitte Lin reads at Beijing University. Li Bingbing stills from "1911"
Teresa Mak in "My Baby Shot Me Down"
Charlene Choi is a "cute, happy snake".